First things first: although bottles are technically packaging, most plastic bottles and beer bottles are not meant to go in any bin, but ought to be returned to the shop. Other packaging made of glass like wine bottles and marmalade jars are meant to go in special glass bins or glass containers you’ll find either in your courtyard, or here and there across the city. So please do not throw any bottles of any kind into the yellow trash bin. Ever. If you are uncertain or can’t bothered to return bottles to the shop then just leave them next to the yellow bin. Thank you. Besides glass, paper, cardboard and organic waste there is the broad field of packaging waste, plastic, wrapping and other recyclable material. And it’s not always that easy to draw the line between recyclable materials – and ‘trash’. 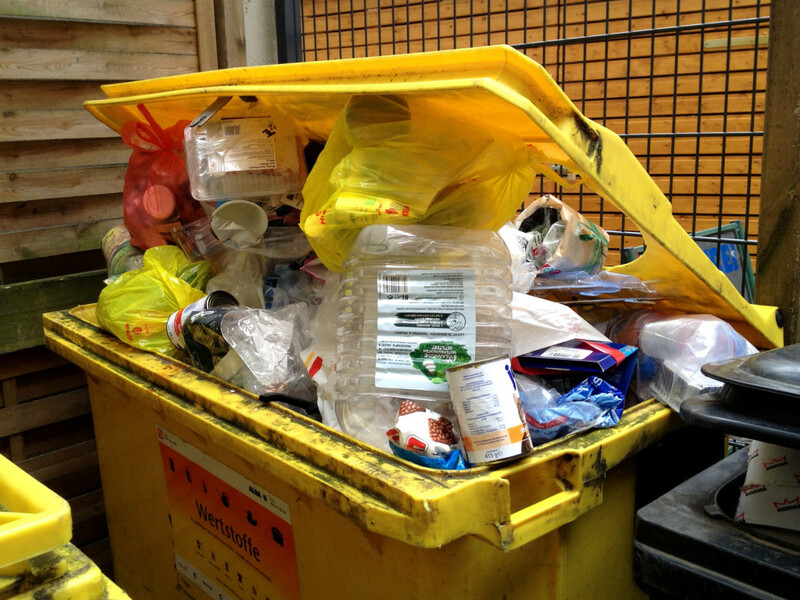 Years ago it used to be a bit less complicated: you were basically asked to throw all packaging and wrapping waste into a yellow trash bin – and the so called “green point” hinted at the recyclability of the packaging waste. Everything else would have to be thrown either into the rather recently introduced orange bin “Wertstofftonne” or into the regular trash bin. plastic cups – like yoghurt pots etc. plastic objects – flower pots, salad bowls, broken toys etc. broken electric devices, electronic devices, computers, mobile phones etc. The above things can always be brought to one of BSR’s recycling centers (See also > the official information page with a list of all locations, opening hours and an interactive map at http://www.bsr.de/9390.html). Batteries and energy-saving bulbs can also be dumped at super markets and consumer electronics stores. Rule of thumb: you can leave batteries and energy-saving bulbs for recycling wherever you can buy batteries and energy-saving bulbs. Textiles and clothes and shoes can either be dumped in ‘donation boxes’ or be directly donated to one of the many charity institutions, that collect old clothes for people who may be in need. See also the page about Clothes and Shoes. Thank you so much for posting this page. I rented an apartment for a month in Berlin but, only speaking English, had trouble figuring out what to do with my recycling. Colored glass and clear glass and paper were easy to figure out, but plastic? Aluminum cans? This site helped me so much! Thank you for letting me leave Berlin as clean a city as I found it to be!